The manual is designed to be used alongside Document J of the Building Regulations coupled with any advice provided by your local Building Control. You should not rely on this manual alone. In the case of boiler stoves you will also need to familiarise yourself with Document G of the Building Regulations and any other relevant plumbing regulations. So we have looked at the primary system and the heat sink radiator. As already suggested this is the foundation of any solid fuel system. Four port boiler. Primary circuit is in black. Radiator flow from stove is in blue, return in orange. For the purpose of clarity the heat sink radiator is not shown on this diagram. Note that it is possible that your radiator circuit might act as a gravity circuit even without the pump on – hot stove water flows up the radiator circuit’s flow pipe through one or more rads and back to the stove. This is usually not desirable (radiators on when one doesn’t want them on). To prevent this one can add a two-port valve next to the pump (closes the circuit completely when the pump is off but opens the circuit when the pump is on). If your boiler stove has four ports on the rear then this makes life easy. Connect your flow and return to the two spare ports (primary circuit on other two already) and add a pump to the return pipe. 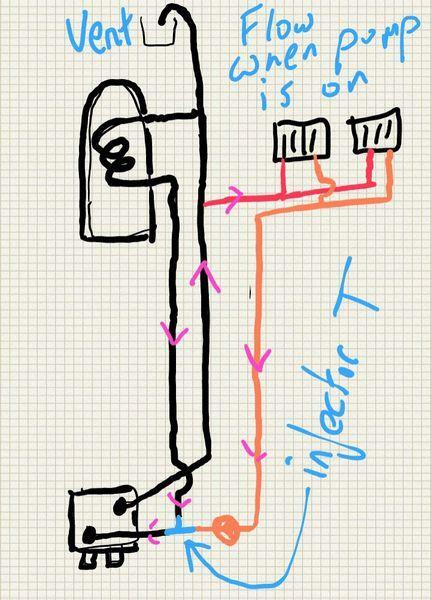 The primary circuit is not affected by the pump because the stove is acting as a buffer between the two circuits (whether pump is on or off the gravity circulation continues as if the pump were not there). Both thermostats are connected to the pump. The thermostat on the PRIMARY CIRCUIT RETURN switches the pump ON when the water returning from the heat sink is hot enough – this ensures that the pump only comes on when the stove is lit and prevents cold water being pumped around the stove which is not good as it encourages condensation within the stove. This thermostat is set at approx. 35-40 degrees centigrade. If the heat sink is a cylinder rather than a radiator then the thermostat ensures the pump does not come on until the cylinder has plenty of hot water (if set at 35-40 degrees). So although very simple in design we do have a “hot water priority” system. The thermostat on the PRIMARY CIRCUIT FLOW switches the pump ON only if the flow pipe from the stove gets particularly hot. It is set at approx. 85 degrees centigrade. 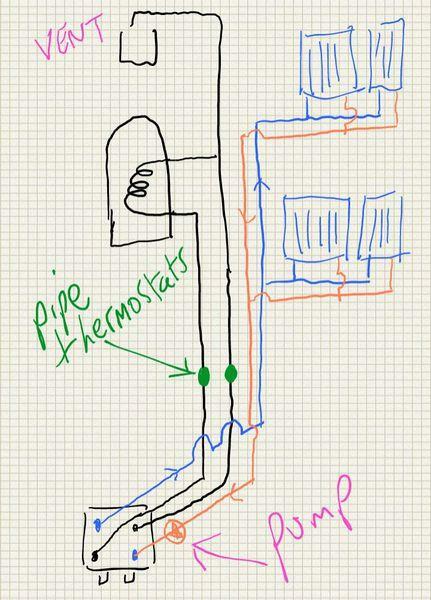 This “overheating” of the flow pipe can take place if the stove is burning out of control (e.g. the door has been left slightly ajar or the user has overloaded the stove with fuel). When the pump comes on the system is cooled (water passing through the radiators). Unlike the primary circuit, the radiator circuit, due to being pumped, can follow any kind of path (up, down, multiple bends etc.) with trapped air being the only concern where pipes travel “up and over” (avoid this or ensure that at the top is some method of air release or collection). Top tip: Running radiator pipes under floors is often fraught with problems. Joists are in the way and Building Regulations might not allow notching or drilling. One way around this is running pipes up into the loft (often following a chimney breast) and then dropping down from the loft into rooms below (often in corners where boxing is less obtrusive). Make sure your header tank is well above all of your pipes. For the purpose of clarity the heat sink radiator is not shown on this diagram. Now the pump DOES affect the gravity circulation. 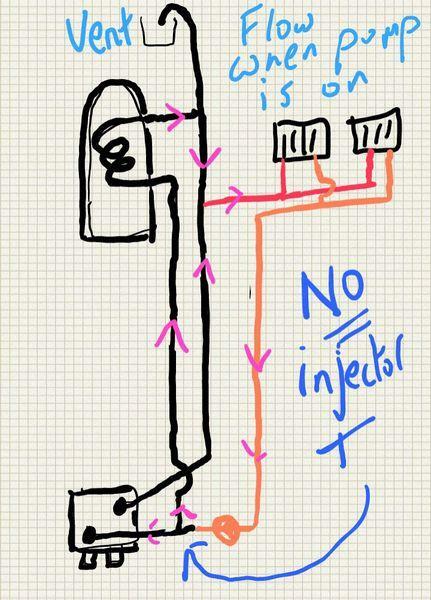 NO injector T. For the purpose of clarity the heat sink radiator is not shown on this diagram. What happens here is that the water flow within the cylinder is reversed. Now a proportion of the cool water returning from the rads (rads have stolen heat) bypasses the stove and travels through the cylinder, stealing heat from the cylinder before travelling back trough the rads. It will still “work” but the cylinder will not benefit whilst the pump is on and may cool somewhat.